It’s easy to see why America’s best-selling trucks are the Ford F-Series. The 2018 Ford F-150 is no exception to that rule. With commanding engines, innovative technology and plenty of customization options, this is the truck you’ve been waiting for. The 2018 F-150 will arrive in fall 2017 with bold new styling updates, a new standard 3.3L V6 engine, more driver assistance and upgraded technologies. 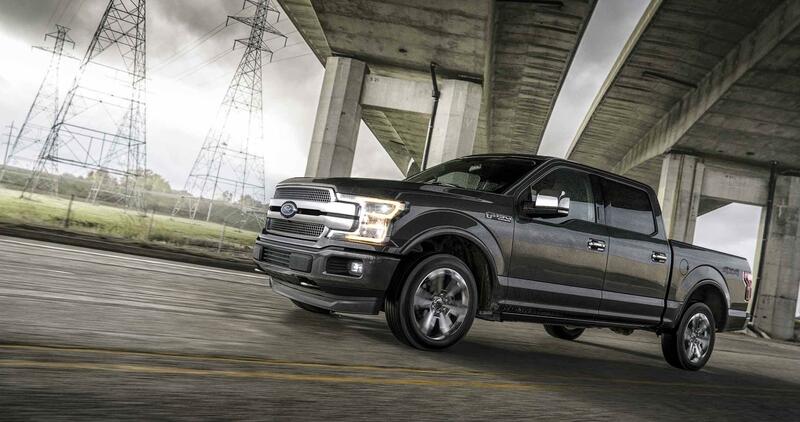 Standard in the 2018 F-150 is a 3.3L V6 that will produce the same amount of HP and torque as the 3.5L V6 it’s replacing, but uses direct injection for increased efficiency. If the all-new standard 3.3L Ti-VCT V6 engine doesn’t rev your engines enough, there are also options such as 2.7L EcoBoost,Ⓡ a 5.0L Ti-VCT V8 and a 3.5L EcoBoost, which come with a 10-speed transmission for improved acceleration and performance. A unique high-output 3.5L EcoBoost engine for the F-150 Raptor, and the new 3.0L Power StokeⓇ Diesel engine are going to make you eager for fall to arrive sooner. Automatic engine start/stop technology is also standard now across the entire F-150 lineup. You can get better gas mileage and less emissions during city driving with this feature. The engine automatically shuts off when you’re idling at a stop light or stop sign, then boosts back up the moment your foot leaves the brakes. Dynamic Hitch Assist gives you a sight line on the instrument panel display, so you can direct your hitch ball to the trailer receiver easily. Dynamic Hitch Assist comes standard on the 2018 F-150, with towing capacity that until now has been limited to three-quarter-ton trucks. Another piece of technology in this bad boy is the Sync 3 Infotainment system. The 2018 F-150 offers a 4G LTE Wi-Fi hotspot connection that supports up to 10 devices. This means you and the crew can have tablets, smartphones, and all kinds of devices connected wherever you go. The 2018 F-150 is the first vehicle in the U.S. to spotlight a premium B&O PLAY audio system, which features 10 speakers customized by HARMAN and Ford engineers. The speaker placement, tuning and calibration were placed specifically to create a platform for your favorite music to boom. Voice activated features, driver assistance and collision avoidance systems are another reason why this truck rocks! You can also lock your car, start your truck remotely, and locate your vehicle all within SYNCⓇ Connect and a Ford Pass smartphone app. With 360 degree surrounding camera and blind spot monitoring, this truck has your back! Trailer attached? No problem, the system works with a trailer too. Adaptive cruise control can help you avoid speeding tickets, and a forward collision warning system with pedestrian detection capability and automatic emergency braking is now available as well. The 2018 F-150 features new tail lights, a redesigned front grille, bumpers, 6 wheel designs and a wide tailgate applique available on select trim levels. The new aluminum wheels range from 17 to 22 inches in diameter. Available LED box lights light up the cargo box, so you can get work done day to night. Side mirror-mounted spotlights can also light up your nights. The F-150 has many trims available, including the F-150 XL, F-150 XLT, F-150 Lariat, F-150 King RanchⓇ, F-150 Platinum and F-150 Limited. With so many options available, it’s no problem finding and customizing the truck that fits your needs. Visit your local Southern California Ford Dealer to find out more.